Michael Clever, Joan Ross, and Cliff Stratton. 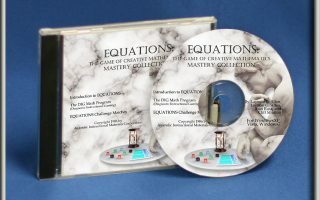 The EQUATIONS Mastery Collection is an encyclopedic anthology of early software programs that teach a broad range of math concepts using an expert computer system capable of playing and monitoring EQUATIONS matches. The DIG Math Program and EQUATIONS Challenge Matches were originally designed to fit into the revolutionary 48K Apple II and PC Jr. microcomputers of the early 1980’s. We have designed a new and convenient menu interface for the programs and updated them so that they operate on current 32-bit and 64-bit Windows and Mac systems. Both versions maintain the original bare bones graphical interface that harkens back to an earlier age in computing. The content of these programs is profound and will turn any user into a master EQUATIONS player adept in both the strategic and advanced mathematical aspects of the game. In the DIG Math (Diagnostic Instructional Gaming) Program, a solitary user plays against the computer in carefully designed EQUATIONS matches. The machine plays as an expert teacher, making moves that lead users to discover and apply a specific math concept in each match. The program includes individualized diagnosis, lessons, and more than a thousand individual matches covering concepts from arithmetic through algebra. DIG Math dramatically accelerates the mastery and spread of new ideas in any class or gaming group. 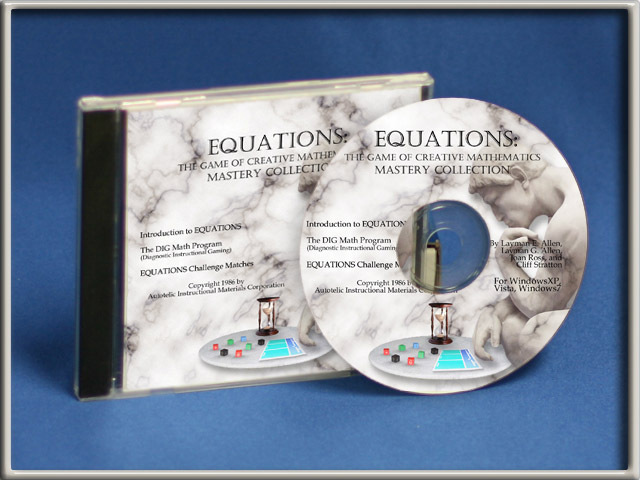 The EQUATIONS Challenge Matches Program allows two or more users to play against each other with the computer coordinating the match as guide, gameboard, coach, referee, and tutor. Challenge Matches reveal the richness of EQUATIONS by showing users how a wide variety of concepts that can be applied in each match. There is also a solitaire “Research Mode” that allows players or teams to investigate the full range of the possible solutions in each match. Players can conduct experiments, and by carefully analyzing the resulting data, discover clues to the identity of the Resources used in the remaining unknown Solutions. The “Research Mode” from EQUATIONS Challenge Matches is an excellent simulation of scientific method used to deal with an evolving mathematical problem. Concepts from the EQUATIONS Challenge Matches are indexed to individual lessons in DIG Math making the whole collection an integrated system for mastery learning.